1. I am thinking… about the mood I’ve been in lately and, on a unrelated note, how much I’d like to take a cruise! Also, I’d like to wish everyone a Happy Earth Day! Today I plan on walking my road and picking up some of the trash people toss out their windows to commemorate the day. 2. I am thankful for… ice cream. 3. From the kitchen… grapenut custard pudding is baking in the oven (although with my oven, who can tell how it will come out). 4. I am wearing… a t-shirt, undies & slippers (what, I just got up!). 5. I am creating… not much lately…I’m in a funk. 6. I am going… to enjoy life, no matter what! 7. I am reading… Thorpe, by Mary Dutton. 8. I am hoping… that Rescue Remedy works for Wolf (cause now Max is acting up, too). 10. Around the house… things need to be dusted. 11. One of my favorite things…lilacs! 12. A few plans for the rest of the week… Salem, breakfast, Treme, walking the dogs, dinner, not in that order. Took this with my camera phone last night after dinner with Lisa (sorry for talking your ear off)…I was so surprised to see lilacs blossoming in downtown Lowell! It was my first time seeing them this year…although both my cousins (in NH & CT) told me they’re blooming. I used to gage the lilacs blossoming by the lilac bush next to my old house…but I don’t live there anymore and there are no lilac bushes in my condo complex. Lots of other greenery…but no lilacs. Beautful they are Lillacs. And the smell: mmmmm. We have to wait still some weeks to have the in full flower here. Pretty! 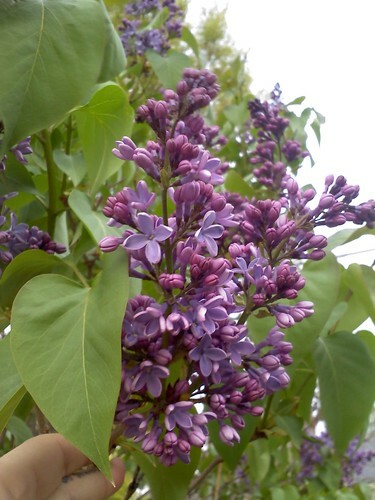 I love lilacs, they remind me of the house I grew up in. They don’t grow here unfortunately. Our lilacs are still tight little mini buds. I think another 2 weeks. I just read Thorpe, too! Wow very cool list! The grapenut custard pudding sounds good. Hey I’m not to far from you – Nashua, NH. Our lilacs aren’t even out yet. So glad I’m not the only one in a creative funk lately. No lilacs here yet, but the crabapple in front of my window is in full bloom. Thanks for coming meteorite hunting with me! That grapenut custard pudding sounds awesome! Great list and great idea! Love the lilacs! Every day they are in bloom, I walk past my lilacs and inhale! Nummy num num – I love the smell of Lilacs. When I was younger and living in Rochester, NY they used to have a Lilac Festival each spring which was just intoxicating. We have a bush that we planted last year – it is green but no blossoms that I’ve seen. Maybe it needs to grow bigger to bloom? I mean, it isn’t like Natick weather is any different from Lowell. Great 13. Love your Snape and Lily pic too. Alan Rickman is my favorite actor . Try some rescue remedy on yourself, or better yet some lavender essential oil. It works on the emotional body and always lightens me up when I use it. Enjoying life no matter what sounds like an excellent plan! Go to the beach Janet….that always helps your “funk”! The lilac’s gorgeous, babe. Don’t sweat the funk. We all have them — and we all pull out of them sooner or later. Rescue Remedy is some good stuff. I am sorry you’re in a funk. It’s been a bit funk-ish here too. We’re still very far from lilacs here in Northern Maine. That’s a great TT idea. I’ve gotta check out Treme. Right now, I’m avoiding responsibilities. Love the lilacs too, we don’t have any in our yard in VA, my 20 year old’s BF dug up a few lilac sprouts at his house, brought them over to our house & planted them for me yesterday so I’m hoping we’ll have some in a few years! a cruise huh? where are you thinking of going? and when? hmmm…. My ears are totally not talked off! You’ll have to try again.